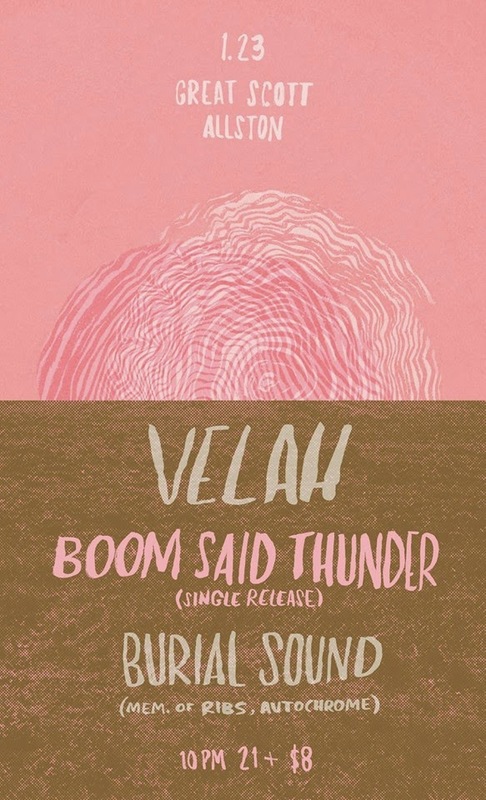 Boom Said Thunder Single Release Party, 1/23 at Great Scott. Fuzz rock trio Boom Said Thunder will return to Boston on Friday, January 23rd to debut their two-song single. A moody concoction including 6:43 fuzz rock steamroller of a track “Carnivore” and 5:45 worth of luxurious and intoxicating trance rock in “Summer Twin”, both of which you can listen to via the advanced demos streaming on Bishop And Rook. Summer Twin will be available as a free digital download via Bandcamp toward the end of the month. Those who attend the band’s Brooklyn and Boston release shows can snag limited edition Summer Twin artwork designed and printed by the band, complete with download links. Follow the band on Facebook and Twitter for more release information.